One of my least favorite parts about summer is that the doors and windows are pretty much nailed shut. In order to keep our 81 degrees of air conditioning contained and keep the 112 degrees from outside getting in, it has to be that way. I break the rules a little at 6am when it’s only 85 degrees outside and get a little fresh air, but really, it’s barely enough for me. So on top of no fresh air, I really hate when dinner stinks up the house. It seems to linger for days…don’t get me wrong, I hate this problem year round, it’s just especially bad when there’s no open door time. Not to mention that my already hightened sense of smell is at a super hero level while pregnant which makes the problem that much worse. Last weekend I had a hankering for pulled pork made in the slow cooker. It’s heaven on sandwiches with pickle relish and in quesadillas – basically it’s dinner and lunch for like 4 days. But the smell…it normally annoys me, but this time of year and at this stage of pregnancy, it’s a no go. So I floated the idea of putting the slow cooker outside to PW. His response surprised me when he said he thought it was a good idea…and it was a good idea. No overwhelming even-my-pillows-smell-like-pork problem AND delicious dinner – genius! Most days I’m domestically challenged. I cooked fish in the house ONE TIME. I can still smell it like the stink somehow got into the walls! Good call on the outdoor crock pot. It’s even worse when the smell lingers in your hair. My youngest is 5 years old and I still can’t stand the smell of cooked bacon following me around! 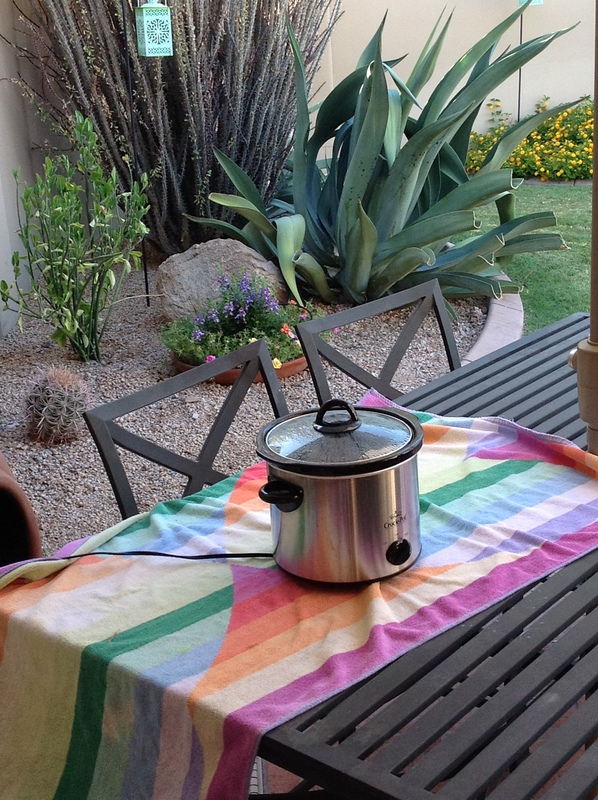 Good idea, putting the slow-cooker outside!